Nothing about Owen Sound’s The Bleeding Carrot can be taken at face value. From the menu to the mandate it upholds with every customer, there is a history with this business that, like many, started when its owner had to leave his previous job. Jim Ansell, owner and manager of The Bleeding Carrot was forced to make a career change due to health-related issues. The process started when he contacted the local Y Employment Centre where he was introduced to the Ontario Self-Employment Benefit program that assists new business start-ups with an income subsidy. This provided Jim with the valuable time to develop a business/marketing plan. The idea? A juice bar. Not new to Owen Sound but the last attempt was 15 years ago and a lot has changed in consumer trends since then – a daring move for someone without prior restaurant experience. He felt the idea could be successful as long as he knew the wants of his potential customers, had a good product and found the right location. The Self-employment Benefit Plan gave Jim the opportunity to learn how to operate and market his business. What he has created is an establishment Owen Sound vegetarians have long awaited and local non-vegetarians see as a new experience. Located at 945 – 2nd Avenue East, The Bleeding Carrot opened on October 9th, 2012. 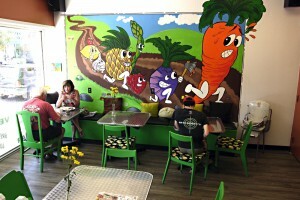 It provides customers with a range of vegetarian and primarily local juices and foods. Local products, bought from the farmer’s market, include eggs, honey, maple syrup, all types of vegetables and coffee. The building’s 2000 square feet gives the bar and restaurant a spacey, open environment to anyone, whether they be strict vegetarians, beginners, or just wanting a good meal. 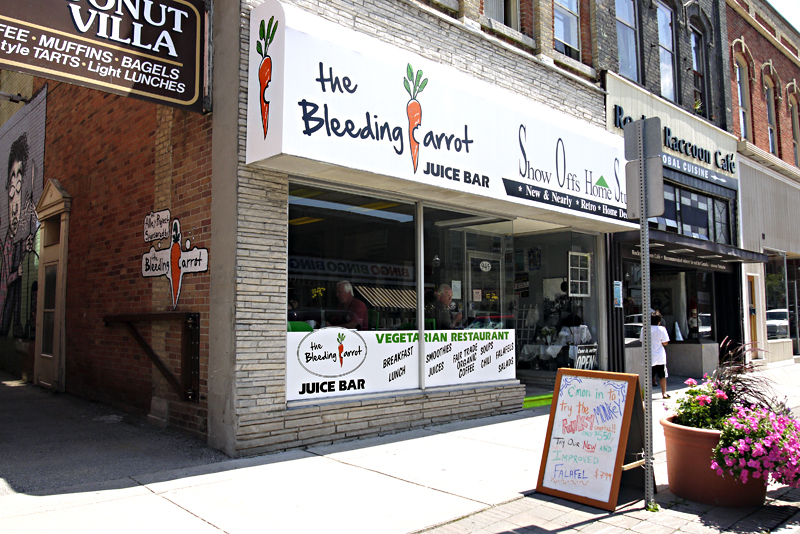 However, the idea for The Bleeding Carrot seemed “More of an urban concept,” says Jim, “But [Owen Sound] deserves to have a juice bar.” When it came time to buy a space the only one available was extremely large for just a juice bar. So, Jim’s wife, a seller of home decor, opened a business within the space called Show Offs Home Stuff, as well as Jim taking his new vegetarian diet and turning it into a restaurant concept. Owner Jim Ansell helping customers with a midday snack. The whole area is open space, including the kitchen, allowing customers to see their food being made. Employees are responsible for doing various tasks, from taking care of the cash to preparing menu items, including all juices. All are customer service oriented and gaining extensive experience in the food industry. Mistakes happen in any business, how you fix it can determine if you have a repeat customer or a walking bad advertisement. When a customer was left waiting over twenty minutes for their order, Jim offered them a free juice sample while she waited and a ten-dollar gift certificate. The lesson: give the customer a reason to come back for what is hopefully a better experience. There is a high value of making sure each customer has a good experience “Otherwise, we haven’t done our job,” Jim affirms. Even with good service and food, winning customers is always the biggest challenge. Jim initially used newspaper and radio but it was too expensive for him so he reverted to using word of mouth which is The Bleeding Carrot’s main promotional tool – let the product and service speak for itself. Jim consistently posts notices on Facebook advertising the day’s specials and feature items. Street level signs announce “what’s on” to local passers-by. Inside, the bright colours and wall-sized cartoon graphics make it memorable and reinforce the humour in his logo – a cartoon carrot with a bite mark. Challenges are always in the future but for The Bleeding Carrot there are two in particular. One is getting people to pay a little extra for a good quality product. Jim understands it’s hard to ask people to pay more. Yes, his coffee costs two dollars, but he guarantees you will never want any other quality coffee. The second challenge, is a menu without meat. Vegetarians already know, you can have a good meal without it but you have to convince the “carnivores” that it’s possible. 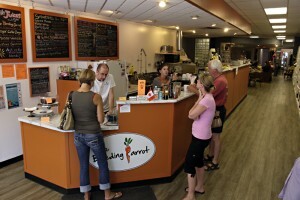 For Jim, who had no prior experience in the restaurant business, The Bleeding Carrot has become an establishment Owen Sound vegetarians are grateful for and others are willing to try. But, most importantly, it’s a safe place for anyone to come in and enjoy a good quality product. For all its history, the value of making sure each customer has a good experience is everything to The Bleeding Carrot. “Otherwise, we haven’t done our job,” Jim affirms. Congrats to one of our graduates from the Ontario Self Employment Benefit program. We co-ordinate this Entrepreneurial support program in Grey and Bruce Counties. Financial support, mentoring, training and development are part of the sessions . We have worked with over 850 in the past 7 years.. EI eligible or Ei reach back clients call 519-371-3232 and get started today !! We’re truly fortunate Jim Ansell made the bold move to open a vegetarian restaurant in Owen Sound. I’ve been vegetarian since 1985 and have gone back and forth between being vegan and lacto-vegetarian. Currently I’m vegan and it’s a struggle sometimes going into non-vegetarian restaurants to get a filling, healthy meal that’s vegan or even just vegetarian. With the Bleeding Carrot I never have a problem with getting a filling, healthy meal that meets my vegan requirements. Also, as the article above states: “The second challenge is a menu without meat. Vegetarians already know, you can have a good meal without it but you have to convince the “carnivores” that it’s possible.” Jim definitely has found the right high quality food offerings to satisfy the non-vegetarians who can use the opportunity to explore a new and tasty alternative to the usual meat centered meal. Thanks to Jim and his wife for all their efforts! I had the great pleasure to stumble in, literally, and discover an incredible place. I am somewhat active in many different groups and city committees over the 3 years I have lived in this beautiful City. I had an idea and approached the owner to discuss. He was very accepting and let me try to organize a drop in for Coffee and chat once a week for the LGBTQ community. I am a very openly gay middle aged woman wanting to meet others in the community to make friends as I really didn’t know many people. The bleeding Carrot staff and management made me feel so welcomed even helping me get the information posted in the BIA Info boxes. Unfortunately it was a dismal failure mainly because of the time I chose to hold this. I tried, gave it a good go but realized that it just didn’t take after about 6 weeks of showing up for 2 hrs. Oh well, maybe another time someone might try again. I loved the conversations I had with staff, all the beautiful things they had for sale and just the peaceful warmness of the place. I drop in often when downtown to check out what’s happening and read their bulletin board. It is a great place and I hope it lasts a long, long time in the downtown. I will be leaving Owen Sound to move back to Ottawa but will remember this GEM forever. Thank you for what you have created here.